We are People for Shoreline Sidewalks. Beginning in June 2017, along with more than a dozen other Shoreline residents, we served on a Sidewalk Advisory Committee organized by the City Council. We worked with city staff to establish criteria for deciding how and where to spend limited funds for sidewalk construction. On the November 2018 general election ballot, Shoreline voters will be asked to consider Shoreline Proposition 1 to fund sidewalk construction. If approved, Proposition 1 will raise the local portion of the Sales and Use tax by 0.2% – that’s 2 cents on a purchase of 10 dollars – to build new sidewalks at 12 high-priority locations throughout the city. We support Proposition 1 and we encourage Shoreline votes to Approve this ballot measure. Proposition 1 will improve safety by separating pedestrian traffic from car traffic. In North City, pedestrians along 5th Avenue NE will no longer need to compete with parked cars for walking space. 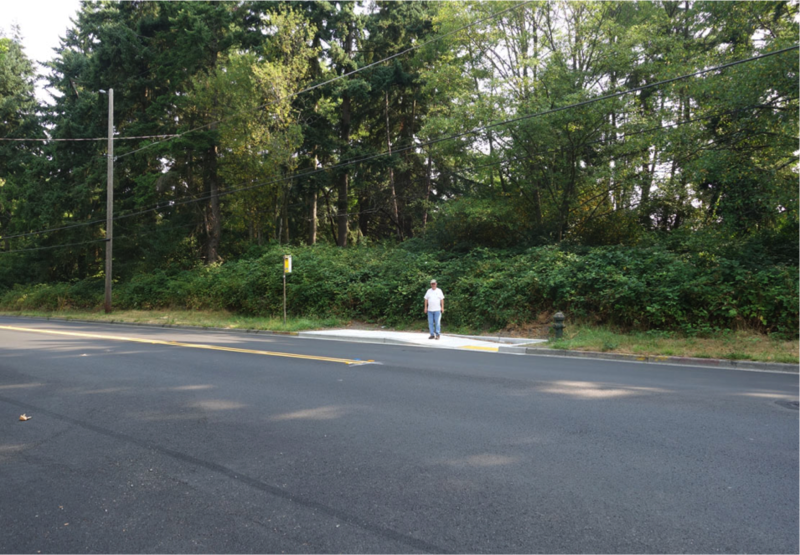 In the Westminster Triangle, we’ll build sidewalks along Westminster Way from N 145th Street to Shoreline Place. Proposition 1 will enhance access to transit by providing safe walking paths along bus routes. In the Echo Lake neighborhood, we’ll connect the isolated sidewalk sections at bus stops on the east side of Meridian Avenue N.
Proposition 1 will connect communities to parks. In the Richmond Beach neighborhood, we’ll build a sidewalk along 20th Avenue NW from NW 195th Street to Saltwater Park. Proposition 1 will fill in gaps in our existing walking paths. In the Ballinger neighborhood, we’ll connect the disjointed sidewalks along Ballinger Way and along 19th Avenue NE. Proposition 1 will benefit all residents. In Richmond Highlands, we’ll build a sidewalk along Linden Avenue North from Shorewood High School to N 185th Street. Pedestrians and drivers will be safer as students go to and from school. There is never a good time to raise taxes. But Shoreline residents have consistently ranked sidewalk improvements as a high priority on the city’s biannual satisfaction surveys. If we believe that sidewalks are important, we must step up to the ballot box and vote to Approve Proposition 1. Visit our campaign at www.ShorelineSidewalks.org to learn more about all 12 projects, and how you can help. We’re going to put our 2 cents to work by voting to Approve Proposition 1. Please join us. The most telling statement in this piece is "There is never a good time to raise taxes". Hear, hear! And that has never been more true for Shoreline residents still grappling with significantly higher car tabs and property taxes over the last 2 years. As a mother, pet owner and avid runner, I am by no means anti sidewalk. But, I am aghast at the extreme tone deafness of a proposal to raise local taxes YET AGAIN. We don't need sidewalks so much as we need to preserve the affordability of our city in order to keep the residents we have and not end up with a mono-culture bedroom community. Sidewalks, yes! But lets hold our city council accountable to pay for them within the existing budget. And once again lower Ridgecrest is majorly left out of the plans. Sure, they'll dump the lightrail station here, but actually doing anything for the existing residents, nope. The example in this op-ed is misleading. The bus stop shown just needs a crosswalk to connect it to the sidewalks and neighborhood on the other side of the street. The Meridian project to connect bus stops is estimated to cost over $3,451,000 (see page 5 of the July 30 staff report at http://cosweb.ci.shoreline.wa.us/uploads/attachments/cck/council/staffreports/2018/staffreport073018-8a.pdf.) A crosswalk would cost $7000 as per the City's ADA Transition Plan slides. And, through the trees in the background of the photo is our famous Interurban Trail, just a few steps away. Asphalt paths could be made to the trail. I brought this up in the City engineer and assistant City Manager in the first Prop 1 meeting last week, and the City had not considered these cheap fixes as alternatives to new sidewalk construction. We hate to nitpick an op-ed, but this is a $3,000,000 discussion, and we think it's worth having. We think at least two other projects worth $4,500,000 need revisiting. And we want to emphasize pedestrian density, and neighborhood centers, and not prioritizing new construction over fixing what we have. Vote no on Prop 1 to create time for this discussion. The sales tax will still be around in two years, and if we want we can try again with a thoughtful, cheaper, and much more impactful plan.